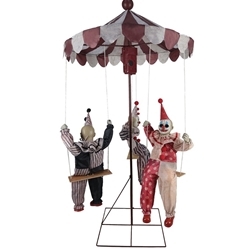 The Clown Go-Round Animated Halloween Decoration measures approximately 72 inches high, 36 inches wide, and 36 inches deep. Add a whole new level of creepy to your Halloween scene! Three forgotten clown dolls from yesteryear are slowly riding a merry-go-round for eternity. This piece works in a discomforting way to keep viewers on their toes. To operate, choose from from Steady-On, Infra-Red Sensor or Step-Here Pad (included) activation options. The infra-red sensor works up to 6.5 feet away and works in all lighting conditions - bright light to no light! Includes power cord and volume control for spooky carnival music. Assembly required. Made of Iron, PVC, polyester and cotton.